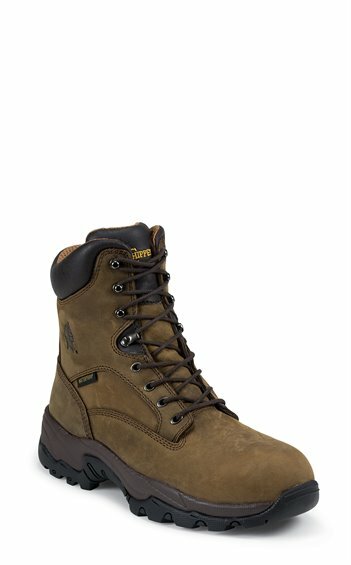 Run, hike, work, or climb in the Graeme Composition Toe 8, 8-inch tall men's boot featuring a rugged golden brown exterior and padded collar crafted from quality leather and is waterproof with seam seal construction that helps keep feet dry. It has Texon® Flexwelt® insoles with a triple-density foam footbed with contoured arch support and air ventilation channels for moisture management. The anti-microbial hydrophilic-filler resists odor and bacteria and absorbs moisture so this boot can withstand daily wear and tear. Its safety toe is 35% lighter than a steel toe cap and has no heat or cold temperature transference. It's non-rusting and non-corrosive and meets or exceeds ASTM F2413-11 standards for impact and compression for ultimate comfort and protection and the rubber outsole offers maximum traction and support on various terrain. I bought my first pair of these boots over 4 years ago, and boy have they lasted! As someone who has an unusual gait due to partially paralyzed foot, I found myself walking the sole off of a pair of boots in under 3 months. My Father recommended Chippewa to me, and I came across these. Best boot purchase I've ever made! I'm so glad that Chippewa is making these again. I just ordered another pair!After 4 years, they are still comfortable, and in relatively good working condition. The pictures I have posted are the condition after two years of heavy freight work, and 2 years of outdoor work in the PACNW. These boots have certainly outlasted my expectations!